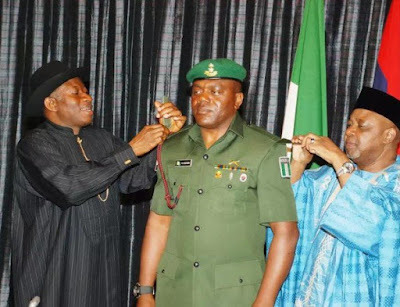 The Economic and Financial Crimes Commission, EFCC, has said that the Aide de Camp to former President Goodluck Jonathan was being held on the instructions of the Nigerian Army. Ojogbane Adegbe, a colonel, has been detained since February 11, his lawyer said. Mr. Adegbe is challenging his arrest and continued detention by the anti-graft agency. An FCT High Court has fixed March 1 for ruling in a Fundamental Human Rights suit filed by Ojogbane Adegbe, a colonel and former Aide de Camp (ADC) to President Goodluck Jonathan. The judge, Yusuf Halilu, fixed the date after hearing the arguments of the parties in the suit. At the resumed hearing of the case, Mr. Adegbe’s lawyer, Ogwu Onoja, told the court that the former ADC filed an application pursuant to the provisions of the law and the rules of the court. Mr. Onoja urged the court to declare that his client’s arrest and continued detention by EFCC since Feb. 11 was unconstitutional and violated his right to personal liberty guaranteed by the 1999 Constitution. He prayed the court to make an order directing EFCC to immediately release the applicant from unlawful detention. Mr. Onoja submitted that the arrest and detention of Adegbe by EFCC violated his right to personal liberty and freedom of movement guaranteed by Section 35 and 41 of the 1999 Constitution. The applicant’s counsel contended that EFCC’s action violated Articles 5, 6 and 12 of the African Charter on Human and Peoples’ Rights. He also asked the court to make an order mandating EFCC to release the plaintiff on bail pending hearing of his case at the competent court of jurisdiction. Mr. Onoja argued that there was no material evidence placed before the court to show that the plaintiff was detained on the directive of the Nigerian Army as claimed by the EFCC. Opposing the application, the EFCC Counsel, Musu Benda, informed the court that the respondent filed a counter affidavit challenging the plaintiff`s motion. Mrs. Benda contended that Mr. Adegbe was not detained by the EFCC, adding that the ex-ADC was undergoing questioning and was kept on the directive of the Nigerian Army. The EFCC counsel, therefore, urged the court to dismiss the application for lack of merit.